The study of Landscape History aims to use the landscape as a historical document to help us understand the past and to show how the landscape reflects past events and activities. Equally, part of the study of landscape history includes projecting the information found in printed documents onto the landscape, such as through the medium of maps, to give a visual impression of how a historic events affected the landscape. Landscape history is an interdisciplinary study, encompassing aspects of geography, archaeology, and local history. It is still only in the early stages of widespread academic acceptance as a subject in its own right, with very few universities offering separate courses in Landscape History. Landscape history has a tradition of amateurism, but breakthrough academic works have also appealed greatly to the public, and sparked their curiosity, leading them to view their own local area with new eyes. “Indeed, if this book [The Lost Villages of England] persuades archaeologists to dig up some of the lost village sites in their own district, it will have achieved something”. The study of landscape history as an individual discipline began in the 1950s with the 1955 publication The Making of the English Landscape by W.G. Hoskins. In this book Hoskins attempted to show the reader how the landscape could be used as a historical document to study aspects of the past, and hoped to ‘appeal to all those who like to travel intelligently, to get away from the guide-book show pieces now and then, and to unearth the reason behind what they are looking at’ (Hoskins, 1955). Landscape History has always had links to amateur (and professional) local history and archaeology, which both Hoskins and Beresford aimed to encourage. It was particularly the work of Maurice Beresford on deserted villages, presented in his 1954 book The Lost Villages of England (as well as Hoskins’ similar study focussed on Warwickshire) that really inspired a more widespread interest in landscape history, which came to fruition in the 1970s. ‘The Society of Landscape Studies’ was founded in 1979, with the ‘aim of advancing public education by promoting the study of the landscape in all its aspects’. Like the landscape itself, its study belongs to everyone to view, study and understand. It was the work of historians on deserted villages that first captured the imagination of academic historians and the public. Beresford first discovered many lost villages in Warwickshire. He initially began to noticed large mounds and hollows which were eventually identified as the site of Bittesby, a lost medieval village. Such villages were abandoned for still largely unknown reasons, although it is principally suggested that poor crop yields on the land forced inhabitants to move elsewhere. Warfare as a result of the Civil War, as well as plagues, are also suggested reasons for depopulation in some villages. Beresford used old maps and documents on Crown lands to locate the villages, after which aerial photographs and excavation were used to explore them further. Through the study of deserted villages and other forms of landscape study, historians are able to add to present knowledge by providing evidence that documentary sources cannot offer, as well as challenge current interpretations through this newfound evidence. A study where landscape history is of crucial importance in understanding the medieval village settlement is at the site of Wharram Percy, a deserted medieval village in Yorkshire. The excavation of this village, taking place over forty years, showed the ‘discontinuity of the village settlement in England and disproved the ethnic links of the village with the Anglo-Saxons.’ [Biddick, 1992] Studies such as this highlight the importance of landscape history in adding to and revising historical interpretations. The discovery of deserted villages are a prime example of how existing documents were used to study the landscape, and how the landscape itself was then used to study a specific aspect of history in a new and innovative way. Beresford, Maurice, The Lost Villages of England, Gloucester: Lutterworth Press, 1954. Beresford, Maurice and Hurst, John G., Deserted Medieval Villages, Gloucester: Lutterworth Press, 1971. Biddick, Kathleen, ‘Book Review, Wharram Percy, Deserted Medieval Village by Maurice Beresford and John Hurst’, American Journal of Archaeology 96, 2 (1992): 392-393. Hoskins, W.G., The Making of the English Landscape, Middlesex: Hodder & Stoughten, 1955. Hoskins, W.G., “Seven Deserted Village Sites in Leicester.” Transactions, 32 (1956): 36-51. To the west of UEA, occupying the western outcrop of Norfolk County is an area known to history as the ‘marshland’. Today, the area is a sparsely populated region of farms and small villages, with the occasional town situated on the outskirts. The land is covered in artificial rivers, ditches and levees. It never exceeds over 20ft above sea level, and much is situated below (Dymond, 1990: 28). This artificially drained area of arable land was created through the intermittent flooding and deposition of deep silts in late-prehistoric times, creating land perfect for farming. (Williamson, 1993: 14) The area is thought to have been first inhabited no earlier than 50AD, when sea levels dropped (Williamson, 1993: 43). This colonisation was soon abandoned as sea levels again rose, but since the Middle Saxon period, many efforts have been made to control the water and to sustain the settlements in the area. Marshland in 700AD was described as just an area of bogs and marshes, but by 1300AD, it had become a prosperous community living off the land that they had drained themselves (Dymond, 1990: 121). Using the landscape, historians have been able to piece together much of the story of this area, utilising the rivers and ditches, fields, and villages. 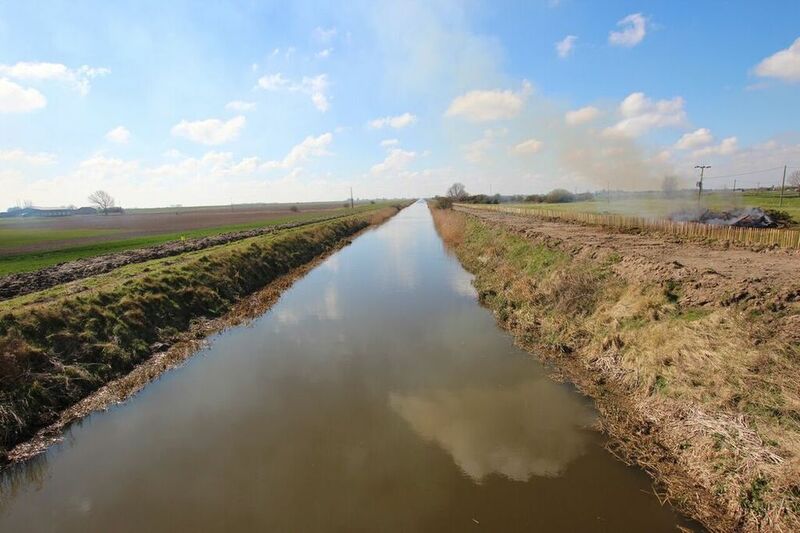 There is only one main river that flows through Marshland, the Great Ouse, through which a whole collection of smaller tributaries and ditches flow into. As can be seen in the first three images, this collection is incredibly intricate, with nearly every farm surrounded by ditches to prevent flooding (Dymond, 1990: 29). What is incredible about this system is that it is all completely artificial. Every ditch, every tributary and even the Great Ouse itself was determined by humans rather than nature (Dymond, 1990: 56). The fourth image will show the original course of the Great Ouse, which in pre-Roman times, was flowing to the North West through Wisbech, but was diverted by Roman engineers to go through Downham Market and then King’s Lynn, where it flowed into the Wash. Landscape historians have been able to infer this, despite a lack of records, by the shape of the Great Ouse following its supposed cut at Littleport (the section of the river that was diverted), and the shape of the tributary of the Little Ouse. When looking at the river, it flows through a section of meandering turns that take it around ox-bow lakes, but is then suddenly diverted North-West to Brandon Creek in a relatively straight line to the Great Ouse, which can clearly be seen in the fifth image. This is not a natural course in a flat landscape. Historians studying this have inferred that Roman engineers designed this course to allow for the area to be drained and cultivated. Evidently this was not enough as evidence of later settlements disappear (until around 700AD), and a new layer of silt is deposited by what is obviously further flooding from the North Sea. By the Domesday Book of 1086 however, the area was again inhabited and many communities began investing in sea banks. Terrington St. Clements still has the leftover bank at its borders, and the nearby village names of Walpole, Walsoken and Walton compliment this in regards to the etymology of the villages’ names (Wall-pole; Wall-soken; Wall-town). From this point onwards we see numerous projects undertaken to protect the area from flooding, nearly all of which are still evident in the landscape today. 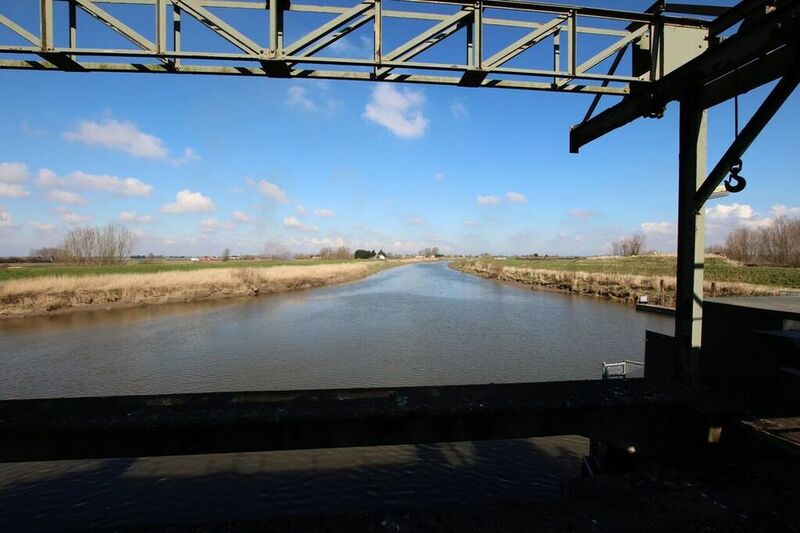 In 1223, the digging of Old Podike was completed to drain water and head off flooding from the South, which was backed up further in 1422-3 with the digging of New Podike (now called Well Creek) three miles to the south at Salters Lode (Dymond, 1990: 122). The remains are still left over today, with a map of Old Podike as the sixth image, followed by an image of New Podike. In 1605 Popham’s Eau was dug for further draining, and in 1630 the ‘Lynn Law’ was enacted, which saw the hiring of Dutch engineer Cornelius Vermudgen to plan an efficient system of draining the Marshland for good. The following decades saw the digging of Old Bedford River (1631), Sam’s Cut (1631), Denver sluice (1650-51), New Bedford River (1651), the Sixteen Foot Drain (1651), and Tong’s Drain (1653), all of which are still operational and continue to be maintained by the local communities(Dymond, 1990: 210-213). Throughout its history Marshland Norfolk was always an agricultural community, and continues to be today. The result of this is strong landscape evidence amongst the fields dating back to around 700AD. Roman-era evidence regarding the use of the fields is very rare in this area as nearly all of it was destroyed in the rising of sea levels pre-700AD. Some has remained however, with Denver especially displaying impressively regular patterns of ridges in the land, sometimes just 17ft across. This is by far the best example of field use in Roman times in the whole area (Dymond, 1990: 85). 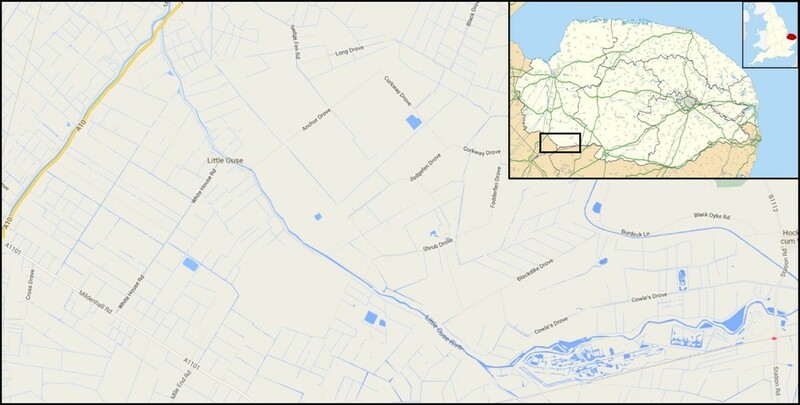 Landscape historians find much more substance to study when looking at medieval field usage, where many areas are still in their original rectangular shape, in contrast to the irregular field patterns exhibited all across central and east Norfolk. (Williamson, 1993: 172) South Croft field in Terrington St. Clement is one of the many examples (Dymond, 1990: 124). One of the best uses of landscape history in Marshland Norfolk has been aerial shots of the fields coupled with extensive field research, which can then be used to discover which areas were most extensively farmed. The North-West stretch of fields along the Smeeth fen in Marshland St. James were discovered to have been most intensely farmed (Hall, Silvester and Hayes, 1988: 29), and the same was seen in Tottenhill to the North (Hall, Silvester and Hayes, 1988: 136). All this research further supported the theory that the parishes were all based around the Smeeth fen, which was easily the most arable. The landscape was the sole reason behind the parishes developing as they did, creating a ‘spoked-wheel’ of parish borders, which can still be seen today in the road system. With every parish granted access to the Smeeth fen, it became a common ground for grazing and farming through which the whole Marshland community benefited from (Dymond, 1990: 125). 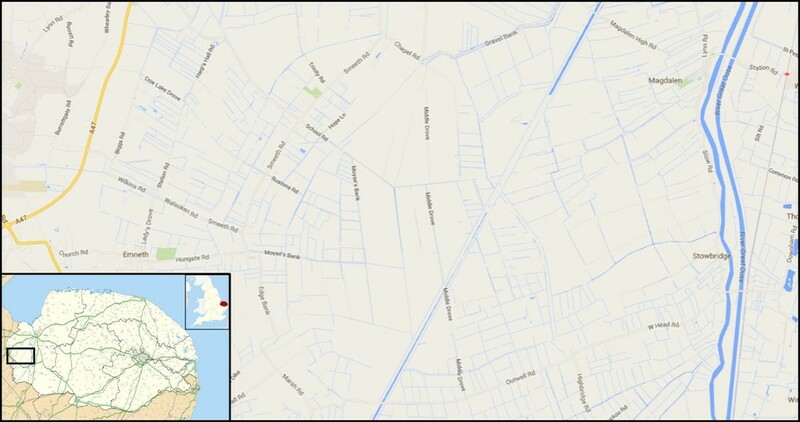 Finally, landscape historians have been very interested in the villages that have developed throughout the Marshland. Their formulation is very unique to the Marshland area, which was based around the rich, arable Smeeth fen, but the individual growth of the villages was very common throughout the whole of Norfolk. Medieval villages were not nucleated but scattered, some of which still have not grown much since they were first documented in the Domesday Book (Dymond, 1990: 101). Villages such as Salter’s Lode, the Walpoles, and Tottenhill have grown only very steadily over the last millennium, whereas villages such as Outwell, Upwell, and Watlington have expanded substantially, with the former two hardly separated by any land at all. King’s Lynn to the North East of Marshland owes its entire growth to the diverting of the Great Ouse in Roman times, where it was now able to receive shipments (Dymond, 1990: 149-151). It is now the largest town in the area by far. Landscape historians have also been able to decipher when each village was established through sampling the materials the houses were originally made from. Looking at Marshland St. James we see the earliest houses being from the early medieval period, around 800AD, and in villages such as Watlington, late-Medieval. The naming of the villages has also been used by landscape historians to date their establishment. Walpole, Walsoken and Walton have all been traced back to the building of the sea wall, still evident in Terrington St. Clement, in the early medieval period (Dymond, 1990: 129-130). Dymond, David, The Norfolk Landscape, Bury St. Edmunds: The Alastair Press, 1990. Gray, Howard Levi, English Field Systems, London: Humphrey Milford, 1915. Hoskins, W.G., The Making of the English Landscape, London: Hodder and Stroughton, 1955. Hall, D., Silvester, R.J. and Hayes, P., The Fenland Project Number 3: Marshland and the Nar Valley, Norfolk, Dereham: Norfolk Archaeological Unit, 1988. Williamson, Tom, The Origin of Norfolk, Manchester: Manchester University Press, 1993. The beliefs of communities have a significant impact on the landscape. For example, almost every settlement, whether medieval or modern, has a religious monument such as a church or a statue depicting the image of a revered saint etc. However it is for example more challenging to actually gage an idea of the beliefs of these worshippers from the monuments than it is to find out about medieval field systems. Religious beliefs and practices affect the landscape in different ways. Religious buildings and structures are easy to recognise, however, the organisation of the religious institutions have other, less obvious, effects. Religious institutions often influence the patterns of boundaries, settlement, land-use and communication whereas the buildings themselves are more modest components of the landscape. In Neolithic Britain people believed that they lived side-by-side with the spirits of the dead. They built stone monuments in the shape of a circle as a domain of the spirit world in which the living rarely entered. Examples of this kind of monument are found at Castlerigg and Avebury. Stonehenge is an extension of this idea. Surrounding the stones at Stonehenge is the domain of the ancestors. Beyond this a 2km zone of early Bronze Age burials separating the domain of the dead with the domain of the living. The burial site was hierarchical, meaning that those that had more money/status were buried in a circle closer to the stones. Since the 1970’s historians and archaeologist shave tried to identify why the stones were placed in those locations, however, it is difficult to discover the ideological factors that urged the builders to choose that spot. Nevertheless two clear factors are visible: a prominent peak in a position associated with the rising of the most southern moon and a relatively distant horizon was required in the south so that when the moon was at its highest point in the south it could be visible until it set. Therefore we can guess that this use of the stones and their landscape allowed them to be used in ancient rituals where the moon was used for predictions and ceremonies. During England’s conversion to Christianity, Pope Gregory ordered that rather than destroy old pagan sites, they should be sanctified with holy water and have Christian alters set up (Bede, Ecclesiastical History, ch. 30). This would allow for the pagans to continue to worship at familiar places making it easier for converts to accept their new faith. Therefore there are many churches even today that are clearly associated with ancient pagan worship. Rudston, near Scarborough, is built on a platform beside a towering prehistoric monolith. Another example is in Jersey, La Hogue Bie, a Norman chapel, is built on the crest of a Neolithic tomb, directly over the burial chamber. Water was considered very important in both pagan and early Christian ritual. Therefore it is unsurprising that springs were revered and Christians often blessed the water and a saint was appointed to watch over the water, for example St Breward’s Well at Camelford. Early churches were often built nearby one of these holy wells and in some cases they were built around the well. Warwick Rodwell notes that ‘superstition and ancient customs played their part in deciding where to place a church’. (Muir 2000) However water provided practical significance as well as ritualistic practices for medieval churches. Monastic houses used the springs to provide drinking water, for sanitation, to feed ponds and power mills. The ideal was a gentle south-facing slope with a stream where the church could be built to the north of the cloister and the stream acting as a drainage system. From 1066 until the mid-thirteenth century, monastic houses and churches in Britain increased rapidly, however, their placement was not determined on the physical landscape but on the availability or land ownership. Richard Muir, 2000. New Reading the Landscape: Fieldwork in Landscape History (Landscape Studies). 2 Edition. Liverpool University Press. Following St. Augustine’s conversion of King Æthelberht of Kent in 597, the English Church began to adhere to the Holy See of Rome. Thus, Henry VIII’s declaration of independence from the papacy in 1534 and Edward VI’s integration of European Protestantism in the mid-sixteenth century marked revolutionary change in Anglo-Christian customs, doctrine and practice. This piece will analyse Reformation church landscapes (their interior design, layout, decoration, etc.) and discuss how architecture and symbolism were used to express the religious and cultural identity of the English Church. [T]hese Reformers would at the next Bout take away our Churches also; this must be next… every Memorial, or Story of a Saint and Prophet is not a Relick of Idolatry or Superstition… [reformers might then] take upon them the Boldness to pull down all Cathedral Churches, because they are made in the Form of a Cross, which some of the precise Sort cannot abide. St Mary’s Church Molland, North Devon, escaped the great Victorian ‘restoration’. It is a rare example of an archetypal Reformation church. In the early eighteenth century, St Mary’s was rebuilt and restructured on the European-Protestant model. Only the Norman font and two mediaeval bells survived. The church was equipped with a communion table, wooden altar rails, a west gallery and plastered walls and ceilings. Exterior of the Church of St Mary, Molland, Devon. Three-decker pulpit, north aisle. 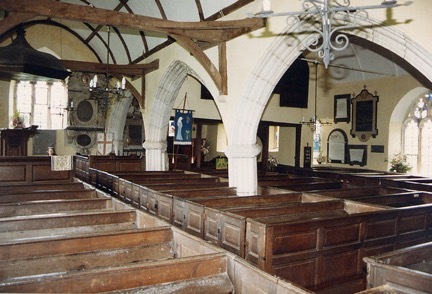 Church of St Mary, Molland.